How Will Urbanites Eat in 2030? At ReThink Food this year, we ran a Future Lab for our sister company, CCD Innovation. The workshop included over 20 executives who manage investment across the US food system. In the process, we collaboratively mapped over 30 businesses that are likely to emerge in the next decade. The project has already resulted in the development of a new business network in this this highly fractured industry. In the summer of 2015, O'Reilly's Solid conference asked us to imagine the IoT in 2030. We assembled some of the brightest minds in technology and biology to explore the Biological Internet of Things. 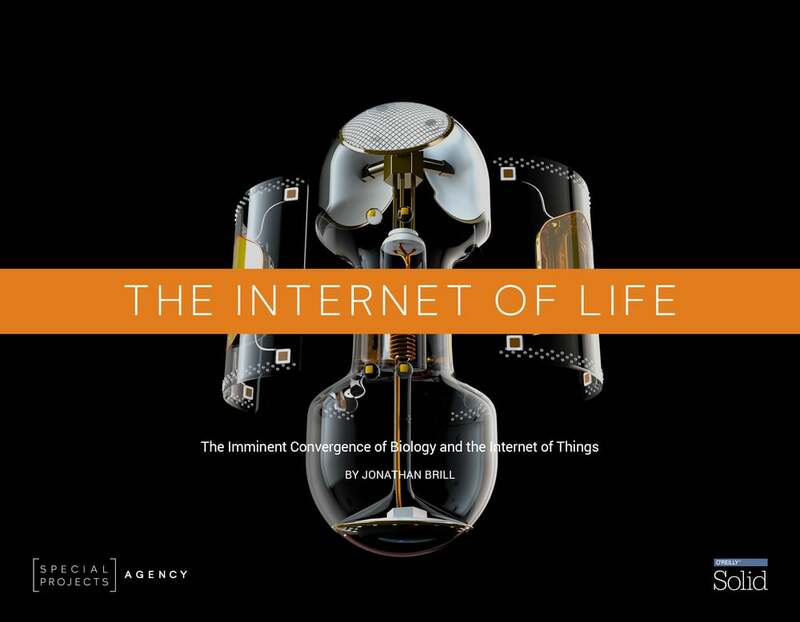 The output was a 75 page report filled with ideas and scenarios about how the Internet of Life will form. Click below to read the report. TED Women asked us to run an innovation dinner and lecture that uses our Why Flavors Work software. Over the course of the dinner, our guests were brought along on an intellectual journey where they ate food prepared by Michelin Star Chef Chris Anderson. Each dish was accompanied by a brief talk about why the food worked from a chemical, cultural and physiological viewpoint. The dinner was hosted at our sister company CCD Innovation. What Will Healthcare Look Like in 10 Years? We collaborated with 250 senior executives in healthcare, IT, mobility, insurance, government and energy at this year's Frost & Sullivan GIL conference. Each of them brought a small window into the future. We acted as a lens, showing how all of these visions are converging to reinvent home healthcare. How will emerging technology impact your industry? This work has resulted in a Health Technology startup. We had the Innovation Council at Emerson out to The Chef's Garden in Ohio, one of the most innovative small businesses in the country, for an offsite meeting. Each course of the 10 course dinner that we developed in collaboration with Chef Jamie Simpson highlighted one of the key best practices we have learned from our 25 years studying serial innovators. During a Future Lab earlier this year, we had the opportunity to sit down with Joi Ito, Director of MIT's Media Lab, to brainstorm about the growing intersection between synthetic biology and the internet of things. Special Projects Agency's Jonathan Brill was recently featured in National Geographic for his work on flavor chemistry. The article discusses our Why Flavors Work software is being used to to help cutting edge chefs understand the science of flavor and create novel dishes. Special Projects Agency's Jonathan Brill talks about emerging technologies that will reshape food at TEDx Arendal. We are proud to developed the winning pitch and experience masterplan for the US Pavilion at the most recent World's Fair, Expo Milano 2015. The project was composed of over 25,000 square feet of exhibits. Over the course of a year, we worked with a national team of policy experts, technologists, food producers and the State Department to understand and articulate America's Vision for the Future of Food.